One of the best ways to save money on your grocery bill is to plan your meals. Meal planning can seem overwhelming for those who are just starting out, especially if you’re trying to stick to a small budget. 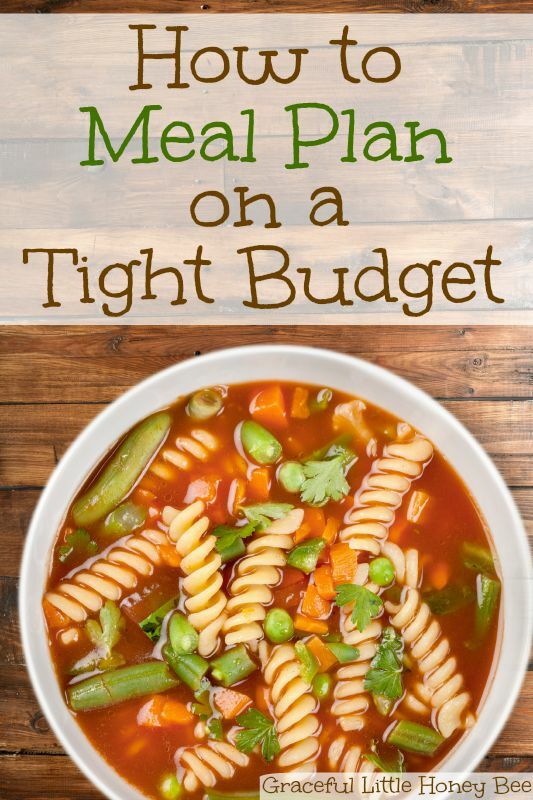 Today I’m going to share with you my top tips for How to Meal Plan on a Tight Budget. One of the easiest ways to save money when meal planning is to plan as many meals as you can around what you already have in your pantry. I can’t emphasize the importance of this enough. If you’re going to make a tight grocery budget work, then you have to be making the most of what you already have in the house. Make a game out of it and see how many meals per week you can plan using ingredients from your pantry. I aim for 2-3 meals from the pantry per week. The next best way to save money when meal planning is to check your local grocery store’s sales flyer and plan meals around what is on sale that week. For example, if Aldi has Chicken Thighs on sale for .89/lb as they often do, I will plan 1-2 meals around them that week such as my Slow Cooker Teriyaki Chicken Thighs. Also, if potatoes and eggs are on sale then I will plan on making my Country Breakfast Bowls. Don’t be afraid to stock up as much as you can on sale items so that you have them when you need them in the future. Also, be sure to download the IBOTTA app to start earning cash back on your grocery purchases to save even more. Plus, you get an extra $1 when you submit your first rebate! Two of the biggest budget busters in the grocery store are meat and dairy. If you can plan a few meals each week that are meat- and dairy-free then you are sure to save money. Try planning meals around cheap proteins like beans or eggs such as my Slow Cooker Pinto Beans with Homemade Cornbread or my Bean & Cheese Freezer Burritos (obviously this one has dairy). Another great way to save money when meal planning is to plan your meals around inexpensive foods. Try oatmeal for breakfast, Southwest Pasta Salad for lunch and Super Simple Beans & Rice for dinner. Check out my post 35 Frugal Foods to Buy When You’re Broke for a list of super frugal foods. Don’t be afraid to plan simple meals because it will make your life easier and save you money. I plan Homemade Waffles and Scrambled Eggs for dinner every Friday night because it’s easy and filling. Check out my list of 30 Frugal Meal Ideas (for when you’re broke) and 35 Frugal Recipes to Make When your Broke for tons of frugal ideas and inspiration. Be sure to download your FREE Weekly Meal Planning Printable! Do you meal plan? What’s your go-to frugal meal? I’d love to know! Do you have recipes for a single person on a tight budget? Dorothy, I'm sorry, but my recipes are made to feed four or more people, but you can always either cut them in half when cooking or freeze the extras in individual portions! Thank you so much for this post. I had never heard of Ibotta. I made an account and will check it out this week after I install the app on my phone. So many apps out there. Its nice to find recommendations. I LOVE Mobisave. I also use Ibotta, Savingstar, Checkout 51, Plenti, Shopmium, and Receipt Hog (you take pics of receipts thru the app and get points. At 1,000 points you can cash out for $5. Doesn't cost you anything, just some time). My go to, quick and cheap dinner for four or five adults is baked tuna and pasta. I use approx 75/100g penne or spiral pasta per person. I cook and drain that al dente, then place in a large bowl or pot for the moment. I can get three tins of tuna at poundland for £1. I use just one of the tins, flake with a fork and add to the pot. I open a small tin of sweetcorn kernels, drain and add to the pot. Lightly stir, then place all ingredients into a large ovenproof dish. Grate some black pepper and add to taste. Scatter some grated cheese on top. Put in preheated oven, uncovered, for approx 20/30 minutes, at 190 degrees celsius, until cheese is melted. I don't normally let the dish brown as it can become too dry, I just cook it until the cheese has melted and the dish is nice and hot. I have started looking into a Garbage garden. Thins such as garlic, onions, lettuce that you throw out can easily be placed in water and later planted in soil. So easy to grow on your countertop.